I've talked about before how I'm a big fan of Fitbit. I've had one now for about 2.5 years now and it's provided me with a wealth of information about my daily movement habits that have helped me stay in much better health than I probably would have otherwise. Much of my journey through health the last few years has been a focus on environment and a better accounting of what I'm actually doing (as opposed to what I perceive I'm doing). Fitbit's ability to graph out my motion over the day annd account for the steps I've taken day after day, week after week propels me to keep up my movement and allows me to recognize when I have not been as active when I should as well as celebrate or appreciate when I have been hit high levels of activity. It's a great tool and I still highly recommend it for people starting the get a grip on their health and looking for some solid data to make better decisions--particularly if you take advantage of the calorie counter app. 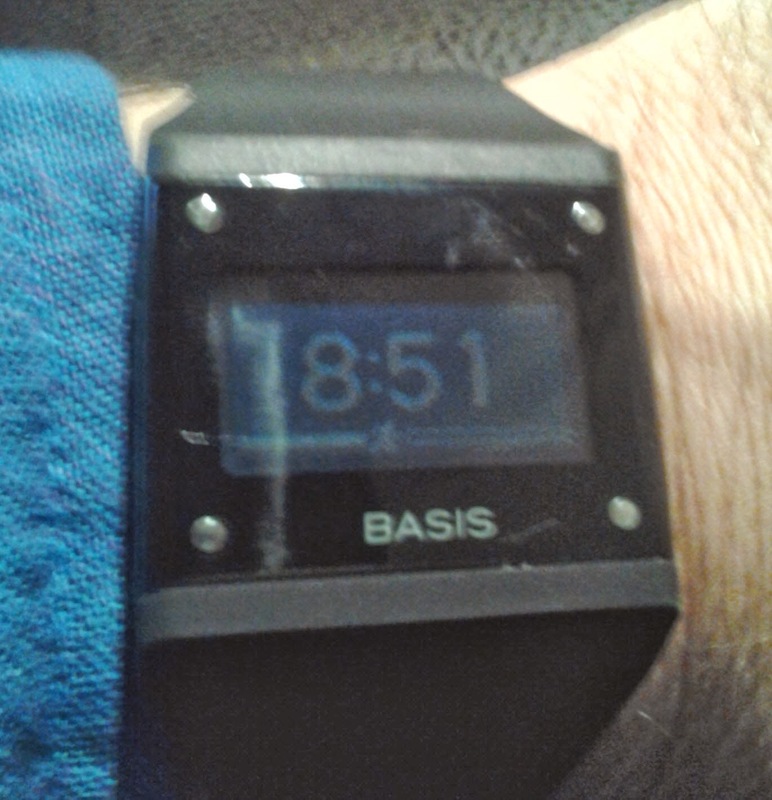 But I recently have taken to an upgrade (largely as the result of a gift) that I'm liking a lot: the Basis. I first came across Basis last spring in an article on one of my feeds. It sounds quite interesting and so I put myself on the waiting list for one or at least to be notified when they were going to be sold. A few months later, an email came to announce that I was eligible to purchase it. The price tag wasn't ideal. Actually, given the robust things it does, it was ideal but it wasn't justifiable given that my Fitbit still worked perfectly. I'm not a fan of disposing of technology because a newer shiny thing is available but the prior technology still works in the ways in which I acquired it for. The Basis kicks things into a higher gear in terms of the information it makes available to me. The Basis records heart rate, steps, skin temp, perspiration, and sleep as well as gives you an ongoing read of calories burned since the start of the day. Clearly, there are not likely to be perfectly accurate, but they do give me a lot more feedback than I otherwise would have been able to accumulate in such a timely and cohesive fashion. As a physical tool, the Basis is pretty great in what it records but more importantly, it's in my visual sight, so I can check it much easier than my Fitbit (which is usually on my underwear band). At any time during the day, I can look to see how far along I am and this too has proved useful. The clock feature has a small progress bar at the bottom with a stick figure on it. 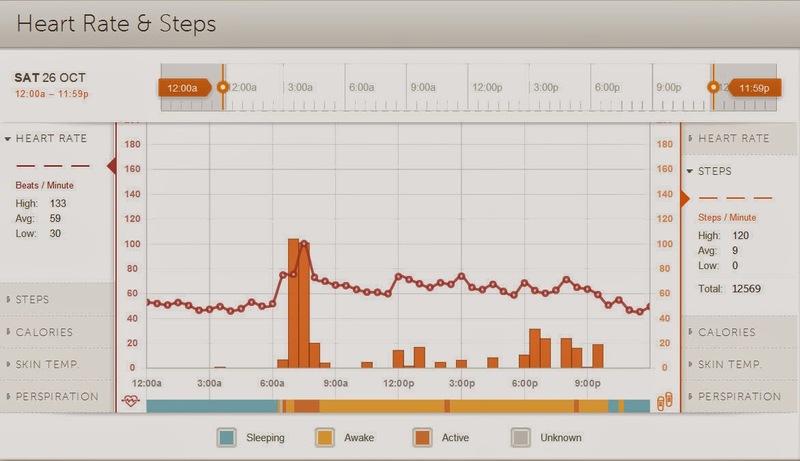 This indicates how close you are to your steps-goal for the day (10,000 steps). If you attain your goal, there's a little trophy icon at the end of the progress line. I can go and check the actual amount of steps taken or calories burned but this progress line gives a very quick and clear indication of where I am for the day. But where the Basis becomes quite robust is with its online interface where you find a lot of different opportunities for feedback and ideas on how to improve your overall health. The first feature is the "My Habits" section of the online interface. This section presents, updates, and encourages self-selective habits (such as getting up at least once an hour between 9 and 5 or setting a daily step-count to achieve). As you achieve these daily goals, they eventually give you more points to unlock other habits. This is an ingenious practice as it requires the slow accumulation of habits so that people don't go all out (and usually fail). The Insights section reveals how many habits you've hit, how many steps on a given day, how many calories, the resting heart rate, amount of sleep, the quality of sleep, and the amount of sleep interruptions. What's obsessively fascinating is that I can examine so much of this data further. I can look at breakdown of my sleep in terms of heart-rate, calories burned, skin-temp and perspiration (which are what are used to calculate the quality of sleep). Data can be a fascinating exploration into patterns and curious finds. There, I can find a day by day breakdown of all the information laid out on interactive charts that allow me to compare and contrast different data. The patterns section can provide me with weeks of data compared to recognize, well, patterns. Step patterns for the last week. 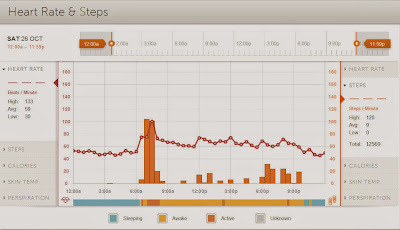 Overlapping data of heart-rate, steps, and activity levels. I'm rather enjoying though there are some drawbacks. The price can be hard for some. However in some ways, it gives way more information and feedback than you may receive from going to a personal trainer or someone else to help you with your health. It's color and style range are limited to black and white square watches (which isn't a drawback for me, but for others who consider such things). I find it hard to get used to a watch since I haven't worn one in over a decade. The need to charge it every 4 days for a few hours can also be challenging, not because it's hard to charge but then there is a loss of gathering information about me for a few hours. The Basis interface online doesn't have a calorie consumption (to account for food intake) or even weigh in area (that can help graph weight changes). They have stated reasons for doing so but I still think it's a useful element to have rather than sending me out to use other programs. But in the end, those are all minor elements. It's a solid tool and I'm enjoying the insights its affording me. For those of us trying to get a hold of our health, what tools do you use?